History: Founded in 1978 by Stefan Eins, Fashion Moda quickly became an important voice in the art world during the late 1970s to mid-1980s. Dubbing its South Bronx location as the Museum of Science, Art, Invention, Technology, and Fantasy, Fashion Moda crossed boundaries and mixed metaphors, which helped to redefine the function of art in the then post-modernist society. Its South Bronx location allowed Fashion Moda the freedom to explore the question “What is art?” and “Who defines it?” Mostly funded by grants from the National Endowment for the Arts (NEA), the New York State Council on the Arts (NYSCA) and other funding agencies, the space encouraged the production of art that was not hamstrung by the contemporary art market and by academic art training. As such, it was a center where white downtown artists interacted with artists and the community of the South Bronx. Fashion Moda was one of several Bronx-based organizations contributing to the borough’s efforts at cultural renewal through the arts in the 1960s and 1970s when the Bronx, in many minds, embodied urban decay. It acknowledged and embraced the artistic contribution of the neighborhood’s new immigrants from the Caribbean, Latin America, and the American South who had replaced the earlier, mainly European immigrants from Manhattan’s Lower East Side. In particular, Fashion Moda celebrated the street life of its neighbors in exhibitions of graffiti art and performances of hip-hop music and break dancing. 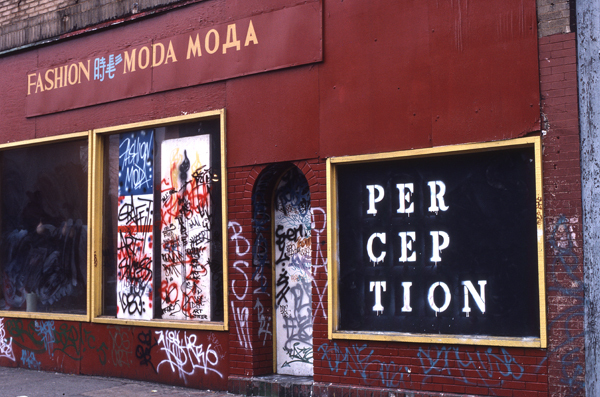 Before it closed its South Bronx location in 1993, Fashion Moda was a major force in establishing new venues for such artists as Keith Haring, David Wojnarowicz, Jenny Holzer, John Ahearn, Kenny Scharf, Tim Rollins+KOS (Kids of Survival), and graffiti artists like Richard Hambleton, Koor, Crash, Daze, and Spank. Asian American artists also partook in Fashion Moda exhibits, including Tomie Arai and Martin Wong. Martin Wong was particularly interested in the nascent and controversial graffiti art form and counted many graffiti artists who made the transition from subway trains to canvas at Fashion Moda as friends. Fashion Moda also had connections to Colab, the most direct of which was their 1979 collaboration on the infamous Times Square show in which artists took on the hot-button issue of the City’s urban housing crisis. Sources: Hoeltzel, Susan. “Fashion Moda: Introduction by Susan Hoeltzel.” Accessed February 3, 2015. http://www.lehman.cuny.edu/vpadvance/artgallery/gallery/talkback/fmsusan…. Lippard, Lucy. “Real Estate and Real Art a la Fashion Moda.” Seven Days (1980). Accessed February 3, 2015. http://www.lehman.cuny.edu/vpadvance/artgallery/gallery/talkback/fmlippa…. NYU Fales Library and Special Collections. “Guide to the Fashion Moda Archive.” Accessed February 3, 2015. http://dlib.nyu.edu/findingaids/html/fales/fashion.html. Webster, Sally. “Fashion Moda: A Bronx Experience.” February 1996. Accessed February 3, 2015. http://www.lehman.cuny.edu/vpadvance/artgallery/gallery/talkback/fmwebst…. Summary: The Fashion Moda Archive is part of the Downtown Collection at Fales Special Collections Library, New York University. In its entirety, it is comprised of business files, nearly 400 photographs of exhibitions and artists, approximately 3200 35 mm slides documenting exhibitions and other events, grant proposals, artist resumes, correspondence, video tapes of the cable TV series “Making Coincidences,” press releases, newspaper articles, reviews, and artworks kept by founder Stefan Eins and others at Fashion Moda. Materials were grouped by format and so slides, press releases, flyers and other information about the same exhibition, event, or artist may be in more than one series. Some cross reference was done but is not comprehensive. APA artists partook in several Fashion Moda group exhibitions, including Paul Ning in “Science Projects 83” (Jul. 18, 1983), Tomie Arai in “Expression Afrikan ‘87” (Mar. 18, 1987), and Martin Wong in “2042: Art at the Speed of Life at Limelight” (Feb. 2, 1988). In addition, graffiti artists such as Daze, whom Martin Wong befriended and whose work he sought to promote, exhibited with some frequency at Fashion Moda. These exhibitions include “Graffiti Art Success for America” (Oct. 18, 1980), “Forgione, Crash, Daze, Poppitz” (Feb. 2, 1985), and the aforementioned “Expression Afrikan ‘87” exhibition. Series III: Artists, Exhibitions, and Related Materials, Subseries C, Box 6 contains photographs of graffiti artists and exhibitions dating from 1980 to 1983 as well as photographs of the “Expression Afrikan ‘87” exhibition. Series III, Subseries F[2, 3, and 7]: Slides and Subseries H: Video-Originals also contain graffiti-related material. Within Series III, Subseries B may be relevant articles, press releases, flyers, and announcements pertaining to these artists and exhibitions. Conditions Governing Access: Contact repository for detailed information on conditions governing access. Open to researchers without restrictions; Appointments are necessary to consult archive and manuscript materials.